Joel Carillet's 2017 travels have included stretches of time in a country that regularly dominates the world's news cycles. In this photo essay for Culture Keeper, he introduces us to people and stories that don't make the headlines, but that are just as instructive in creating a true portrait of Iraq as are all the other stories we hear. Muhamed, on the right and from Anbar, and Khalid, in the center and from Mosul, took my order one night for a falafel sandwich and an Iranian yogurt drink. But they didn't let me pay for it. 25-year-old Ali Khalil Murat sells tamarind juice outside the citadel in Erbil, Iraq. Originally from Damascus, Syria, he has lived in Erbil for the past four years. While I photographed in the square here, he poured me a complimentary drink, just as he had done a couple days earlier. It was delicious. Not many homes had people in them when I visited Qaraqosh, a predominately Christian town in northern Iraq that ISIS overran in 2014. ISIS was then pushed out of Qaraqosh in 2016. I stopped when I saw this Syrian Orthodox family at work at one home, cleaning up some of the mess left by ISIS, including charred walls. They allowed me to take a few photos inside and then this family portrait as I prepared to leave. Before I got away, however, they loaded up a plastic bag with lunch and placed it in my hands. Amer fled Damascus, Syria, three years ago. 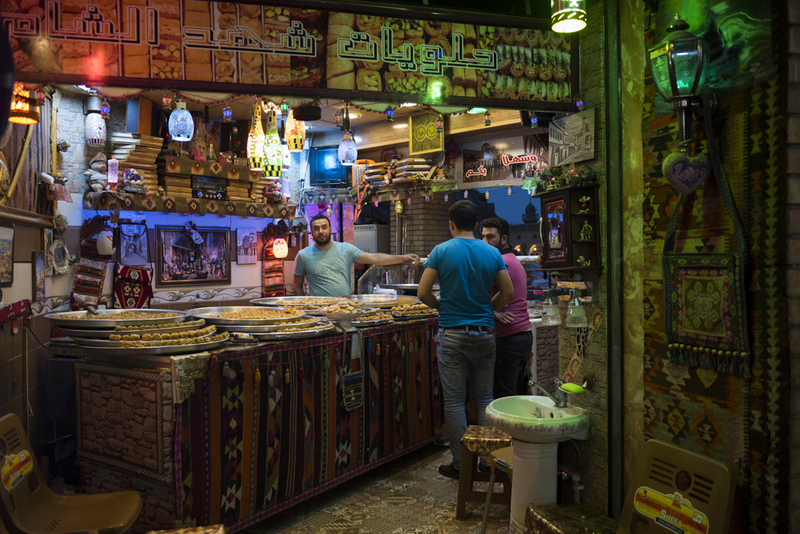 Via Beirut, Lebanon, he came to Erbil, the capital of the Kurdistan region of Iraq, where he now sells things like kunafeh (also spelled kanafah or kunafah), a delicious cheese-based pastry. When I paused at his shop and asked to take his picture, Amer offered a plate of kunafeh for free. "If I come back tomorrow and want to buy a plate, how much will it be?" I asked. "Also free." At the entrance to Qaraqosh, I met Bashar Azoo Boutros Alkhashanna, a 50-year-old Syriac Catholic selling ice from the back of a truck. After I asked to photograph him—he said yes—he bought me a tea, shared some bread, and, before I continued on into town, gave me two packs of gum. He said he didn’t know why Christians in America didn’t do more for Christians in Iraq. Traveling by road between the cities of Sulaymaniyah and Erbil, I was dropped off in the town of Koya, where I hoped to leave my backpack at some shop for an hour or so while I walked around the town, particularly its old souk. Then I would find another ride to continue on to Erbil. I was asking a shopkeeper where the old part of the souk was, but having difficulty due to the language barrier, when a man passing by overheard and said, "Can I help you?" He took me to the old part of the souk, and then asked if there was anything more I hoped to see in Koya. I mentioned an old church on the edge of town that I had read about. He said, "I know it. I'll drive you there." But first a stop at his house to drop off the vegetables he had just bought. We stayed at the house for an hour or so, where I met his wife and little daughter, and ate watermelon and talked about the future of Iraq. Then we drove to the old church. When I asked if any Christians still lived in town, he said, "Yes, they have their own village. I'll drive you there." And so we went, arriving just as the service was ending at the Chaldean Catholic church, where we met many gracious parishioners and the priest. The sun would be setting soon, and the next stop would be the station where I would catch a shared taxi to Erbil, if I hadn't already missed the last one. "My brother, I think you will make the last taxi," my friend said. "But if not, you know you have a home in Koya." Joel Carillet is a Tennessee-based photographer and writer who spends about half of each year overseas, chronicling places and people in a variety of circumstances, from beach parties in Thailand to the migrant crisis in the Greek islands. Last year his work was shown in a photo exhibition called “And Who Is My Neighbor? ” His work can also be found on his blog and on Instagram.